Trams and buses are hampered by road congestion, excessively low speed and traffic management policies that prioritise cars over public transport. These issues diminish user beneﬁt and inﬂate operating costs, discouraging use of trams and buses. To use the road network more efficiently, we must expand the prioritisation of public transport on the road network into the central city and employment centres. This is relevant for all routes on the Principal Public Transport Network, not just those accessing the city or employment centres. Improving tram right-of-way and priority, including re-allocation of existing road space with a focus on key location, will increase speed and reliability and improve tram utilisation. The current situation results in delays for all road users, proving an inefficient system of competing modes sharing limited road space. 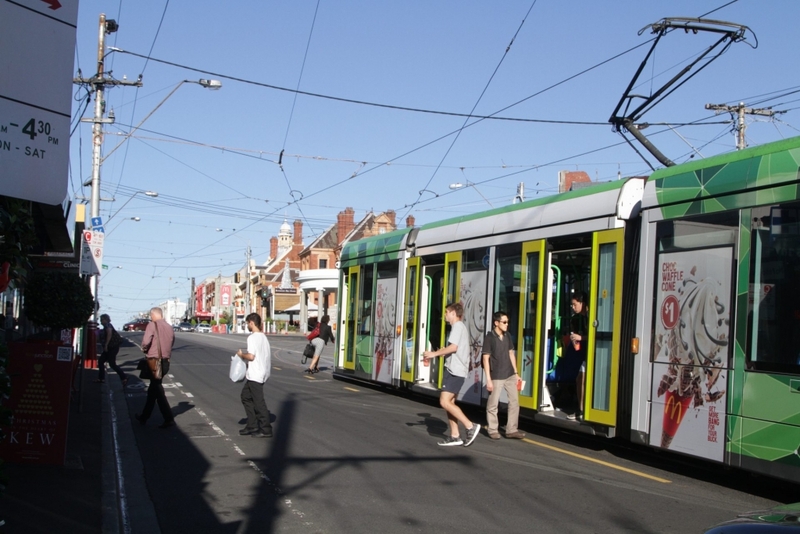 Road space allocation changes will allow trams to play a vital role in the city’s transport system, particularly in the linking of the inner and middle suburbs to employment, educational, medical and other activity clusters in Melbourne’s CBD and surrounds, and in providing local access to inner suburban strip shopping centres.